Lasagna gardening is a no-dig, no-till organic gardening method that results in rich, fluffy soil with very little work from the gardener. The name "lasagna gardening" has nothing to do with what you'll be growing in this garden. It refers to the method of building the garden, which is, essentially, adding layers of organic materials that will “cook down” over time, resulting in rich, fluffy soil that will help your plants thrive. Also known as “sheet composting,” lasagna gardening is great for the environment because you're using your yard and kitchen waste and essentially composting it in place to make a new garden. One of the best things about lasagna gardening is how easy it is. You don't have to remove existing sod and weeds. You don't have to double dig. In fact, you don't have to work the soil at all. The first layer of your lasagna garden consists of either brown corrugated cardboard or three layers of newspaper laid directly on top of the grass or weeds in the area you've selected for your garden. Wet this layer down to keep everything in place and start the decomposition process. The grass or weeds will break down fairly quickly because they will be smothered by the newspaper or cardboard, as well as by the materials you're going to layer on top of them. This layer also provides a dark, moist area to attract earthworms that will loosen up the soil as they tunnel through it. Just as with an edible lasagna, there is some importance to the methods you use to build your lasagna garden. You'll want to alternate layers of “browns” such as fall leaves, shredded newspaper, peat, and pine needles with layers of “greens” such as vegetable scraps, garden trimmings, and grass clippings. In general, you want your "brown” layers to be about twice as deep as your “green” layers, but there's no need to get finicky about this. Just layer browns and greens, and a lasagna garden will result. What you want at the end of your layering process is a two-foot tall layered bed. You'll be amazed at how much this will shrink down in a few short weeks. You can make a lasagna garden at any time of year. Fall is an optimum time for many gardeners because of the number of organic materials you can get for free thanks to fallen leaves and general yard waste from cleaning up the rest of the yard and garden. You can let the lasagna garden sit and break down all winter. By spring, it will be ready to plant in with a minimum of effort. Also, fall rains and winter snow will keep the materials in your lasagna garden moist, which will help them break down faster. 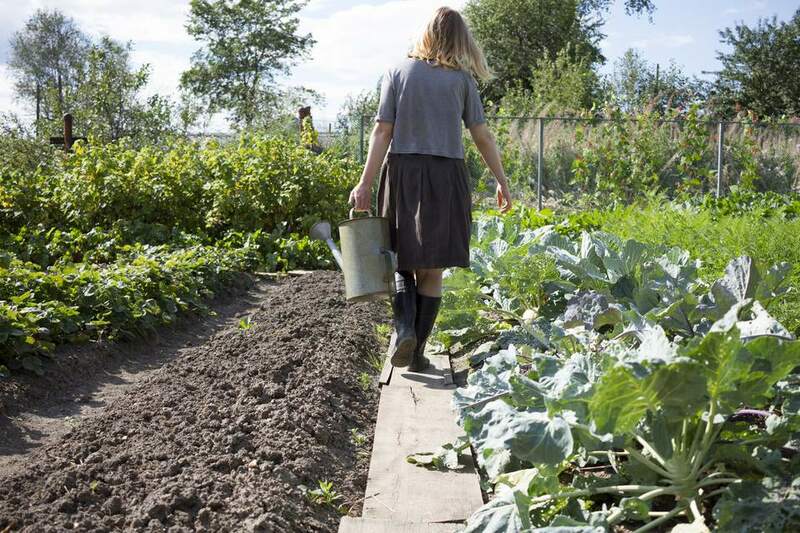 If you choose to make a lasagna garden in spring or summer, you will need to consider adding more "soil-like" amendments to the bed, such as peat or topsoil, so that you can plant in the garden right away. If you make the bed in spring, layer as many greens and browns as you can, with layers of finished compost, peat, or topsoil interspersed in them. Finish off the entire bed with three or four inches of finished compost or topsoil, and plant. The bed will settle some over the season as the layers underneath decompose. When it's time to plant, just dig down into the bed as you would with any other garden. If you used newspaper as your bottom layer, the shovel would most likely go right through, exposing nice, loose soil underneath. If you used cardboard, you might have to cut a hole in it at each spot where you want to plant something. To maintain the garden, simply add mulch to the top of the bed in the form of straw, grass clippings, bark mulch, or chopped leaves. Once it's established, you will care for a lasagna garden just as you would any other: weed and water when necessary, and plant to your heart's content. Few weeds, thanks to the newspaper suppressing them from below and the mulch covering the soil from above. Better water retention, because compost (which is what you made by layering all of those materials) holds water better than regular garden soil, especially if your native soil is sandy or deficient in organic matter. Less need for fertilizer, because you planted your garden in almost pure compost, which is very nutrient-rich. Soil that is easy to work: crumbly, loose, and fluffy. Lasagna gardening is fun, easy, and allows you to make new gardens at a much faster rate than the old double-digging method. Now your only problem will be finding plants to fill all of those new gardens!